There's a rumor going 'round that Crysis, the 2007 shooter that turned many a macho PC into blubbering masses of tears and pain, is coming to the Xbox 360. 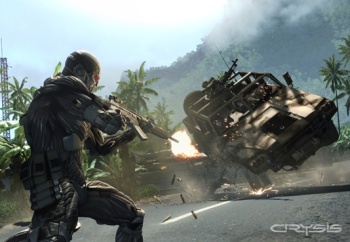 Two things about Crysis were immediately apparent when the game came out in late 2007: one, it was the most visually stunning achievement in the history of videogames for those who had the hardware to run it, and two, nobody had the hardware to run it. Especially not console owners, according to Crytek Senior Game Designer Bernd Diemer, who said in 2006 that the Xbox 360 and PlayStation 3 just didn't have the stones to run the game properly. But now it appears that something, somewhere, has changed. South Korea's Game Rating Board has posted a new rating [Google translated] for Crysis - for the Xbox 360. This is not Crysis 2, which is already out for the 360 in Korea, but Crytek's original nanosuit killfest, confirmed by Korean gaming site Inven [also Google translated, horribly], which got the official word from EA Korea that the game is in the works. There's no release date at this point nor much information about anything else, including how Crytek and/or EA managed to get the game running adequately on the 360. Did the boys in the lab figure out how to squeeze a little more juice out of Microsoft's consoles, or are the boys in the boardroom a little more willing to compromise for a piece of the console action than Crytek was in '06?